Róger Calero, Socialist Worker presidential candidate, joins January 24 union rally at Dakota Premium on eve of vote. 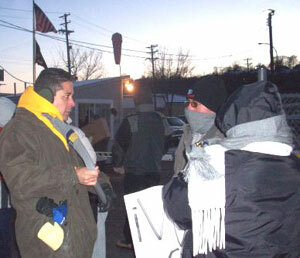 ST. PAUL, MinnesotaRóger Calero, the Socialist Workers Party candidate for U.S. president, joined a pro-union demonstration outside the Dakota Premium meatpacking plant here January 24. He was welcomed by the unionists. A number of them recognized Calero, who worked on the kill floor at the slaughterhouse in 2000. They remembered him as one of the activists in their fight to win a union and a union contract, which they finally won in 2002. Calero said he supported workers who were calling for a yes vote in the next days election that was to decide whether or not the union would remain at the plant (see news article on this page). The next day Calero was among those at the UFCW Local 789 union hall who greeted Dakota workers arriving after work to celebrate their victorya nearly 2-1 vote in favor of the union. Rebecca Williamson, who works at Dakota Premium and is the Socialist Workers Party candidate for U.S. Congress in Minnesotas 5th district, joined Calero at a January 25 forum at the socialist campaign headquarters here. Both candidates pointed to the fight at Dakota as an example of how workers, both born here and abroad, can fight shoulder to shoulder as part of the broader emerging working-class vanguard in this country. Calero noted that the conditions working people facefrom lower real wages to dangerous job conditions, racist and sexist discrimination, and imperialist warare not a malfunction in the system but rather are produced by the natural workings of capitalism. Our real enemy is the capitalist class itself and its two-party system, through which they rule. Working people need to build their own partya labor partythrough which we can fight for our own class interests in the political arena, in opposition to the Democrats, Republicans, and any other capitalist parties, he said. CHICAGOCapping several days of campaigning in Illinois and Indiana, Socialist Workers Party presidential candidate Róger Calero joined in solidarity with nine workers formerly employed at American Meat Packing Corp. (AMPAC) in federal court January 23 (see news article on page 5). Calero and campaign supporters introduced workers to What the Socialist Workers 2008 campaign fights for, the special four-page section in a recent issue of the Militant. Some of the former AMPAC workers enjoyed seeing again the photo of Calero with fellow inmates in a Houston federal immigration jail in 2002, having joined in the successful campaign to win Caleros release from jail and his later victory over la migras efforts to deport him. When Calero said that running mate Alyson Kennedy would be on tour here later, several workers expressed interest in getting together with her to find out more about the campaign.